Out lesbian Allison Ikley-Freeman, 26, was elected in November to represent conservative west Tulsa in the Oklahoma State Senate. 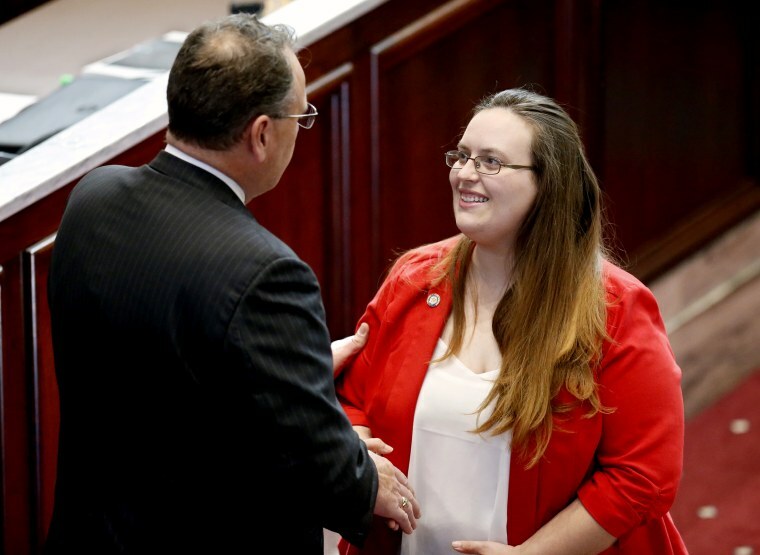 Allison Ikley-Freeman, a 26-year-old lesbian, was elected in November to represent Tulsa's conservative District 37 in the Oklahoma State Senate. Prior to becoming a Democratic state senator, Ikley-Freeman worked as a therapist at a nonprofit mental health agency in Tulsa. NBC News spoke with Ikley-Freeman for NBC Out's #Pride30 special. When you were sworn into the Oklahoma State Senate, you said, “I wasn’t supposed to be here.” What did you mean by this? "I meant a lot of different things. Statistically, there were a lot of reasons why I wasn't supposed to be a senator. I grew up really low income, and poor kids usually don’t make it to become a senator. As an "out" person, I didn’t think I was really ever going to become a political figure. When I was beginning my campaign, there was a strategy [session], and the downside or my biggest weakness was: LGBT bi-racial family. In the district I'm in, I wasn't supposed to win being a Democrat. I didn’t raise a whole lot of money, either. So in my head, I didn’t fit the script of what I thought a senator should be." "For me, as a mental health professional, I'd really like to increase the focus on mental health issues. I am the first therapist to be elected to the Oklahoma legislature. There were a few other professionals who have done work in the mental health field, but they’ve all left this year. I'm now the only person with a mental health background. I'm worried that the legislature is headed for a punitive direction, and they won’t understand. I fear a lot of things related to mental health. I decided to pursue the mental health field, because I have always been a natural helper. I was always the person in high school that my friends would go to for advice." What does "pride" mean to you? "Pride means a comfortableness being in my own skin -– being able to be who I am, not feeling like I have to hide myself or my wife or my family. Being able to talk openly about my life, and everything involved in my life."